Spring Flooding 2016, Are You Ready? While spring brings us longer days and warmer weather, Mother Nature sometimes has her own agenda when it comes to “Spring Flooding”, which can include heavy rains and rapid snow melt. 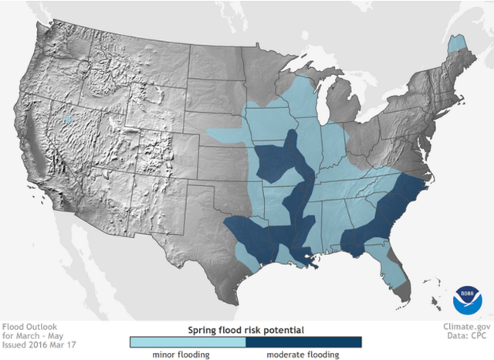 The NOAA Spring Outlook for April-May shows the risk of minor to moderate spring flooding throughout the Midwest and the South for the spring of 2016. When spring flooding events threaten, having the ability to quickly fill and place sandbags can save lives and protect homes, businesses and communities from costly damage. Providing the needed protection also reduces the clean up costs. Just a couple inches of water within a home or business can cause tens of thousands of dollars in damage not to mention all the time needed to clean up and make repairs. The average flood claim is close to $34,000! You don’t have to live in a “High Risk” flood zone to suffer flood damage. 20% of all flood insurance claims occur in moderate-to-low-risk zones. The SandMaster Sandbagging System allows for 3-people to do the work of 50, providing large quantities of sandbags in a very short period of time. Transform your skid steer or loader into an incredible sandbag filling prodigy, making sandbagging a very viable and cost effective solution for your emergency flood control needs. When flood events threaten, time is a commodity that we never have enough of. Being able to utilize the time that is available in the most efficient and cost effective way, can really make a difference in providing the needed protection ahead of the rising waters. The SandMaster Sandbagging System can provide more bags in less time with fewer people, ultimately saving lives and property.